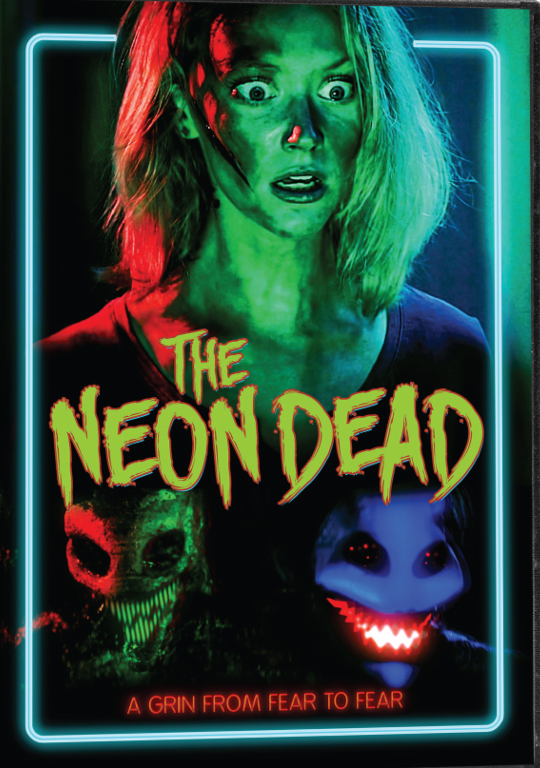 The Neon Dead is about an unemployed recent college graduate named Allison (Marie Barker) who discovers that her new home is occupied by a group of undead voodoo zombies. To get rid of the problem Allison calls on two paranormal exterminators, Desmond and Jake, who are eager to take the job. But this particular paranormal case may be more than they bargained for. 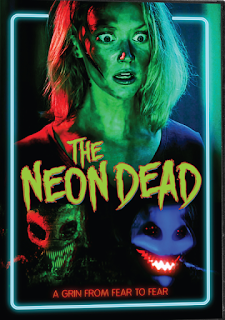 The Neon Dead has a rather obvious ode to the days of video stores and a bygone era of the home video explosion and the creative and imaginative horror films that came with it. The films main character, Desmond (Greg Garrison), works in a video store located in a supermarket (remember those days? ), the title The Neon Dead is a nod to the 1981 indie horror staple The Evil Dead, and one scene displays a Tales From the Crypt comic. So the film does not try to hide it's influences, it instead wheres them very proudly on its sleeve. This nostalgia in horror, particularly indie horror, seems pretty common these days with varying degrees of success. I'm happy to say that The Neon Dead plays the nostalgia card pretty well and captures the fun and campy feel writer/director Torey Haas was most likely going for. I'll start by pointing out the strength in the casting. Marie Barker as Allison is severely likeable in this film. She's an independent woman with a professional demeanor (recent college graduate living on her own) who also has a wide eyed child-like innocence about her that captures her character perfectly as a young woman ready to start her career. Greg Garrison also does a great job as the cocky but charming Desmond who has an apparent and immediate attraction to Allison. This attraction pushes Desmond, along with his partner Jake (Dylan Schettina), to get the job done no matter what. The likeable and somewhat clumsy acting of the three leads is endearing and we root for these characters. The wonderful neon creature design is another thing The Neon Dead has going for it. This isn't Avatar-like technology here folks, but on a reported $17,000 budget the undead look like demented glowing Snapchat filters that look like a twisted masquerade party inside of a dead fun house rave. Just the sight of them is high energy and tons of fun and it's best to watch this in the total dark (duh) so the neon colors will be the most effective. At the center of the film is a creative little back story that explains how the undead came to be in the house and tells how they are more than just zombies, this is mentioned several times throughout the film: they're zombies but...there's more to it than that! It's a fun little history that plays out like an episode of Tales From the Crypt. The one aspect of the film that doesn't add anything to it was the music. I wish it had a more loud and energetic feel to it at times, combined with the loud look of the undead it could have enhanced several scenes. Instead the music feels flat at times and even seems to drag down the pacing at certain points. The film and its characters have a nonchalant feel that is an oblivious and funny portrayal of the wacky and potentially deadly adventure that is playing out on the screen. The attitude throughout The Neon Dead is, “ok, we're going to fight some undead voodoo zombies and save the world today.” It plays off the youthfulness of the characters and combined with fun and campy lines like, “no one turns my friend into a zombie and gets away with it,” The Neon Dead is an all around great time. The climax of the film has what looks like good old fashion claymation on display in a swirling video game-like world of racing red and green lights that caps off the film nicely and brings full circle the ode to a bygone era of horror that was mentioned earlier. Turn off the lights and grab some popcorn and just have fun watching this one! And watch through the end credits. Oh good! It's a fun one, you can find it on Amazon Instant Video.